We really appreciated it though when we were called on day of check-in and was told about freezing rain and that we could arrive earlier if we desired. We were then told to stop by the Food Lion (was told directions to get there) to pick up any food incase of inclement weather. That was so wonderful and helpful and we could not ask for better service. That one act alone, and at the beginning of the trip none the less, won us over for services. Thank you for that!! The property and amenities were wonderful and beautiful! High tech and reliable. Anniversary get away and engagement!!!!!! We got engaged in the living room of the cabin :)) We went hiking in Bryson City and went shopping in Bryson City and Cherokee. Visited Harrahs Casino one night and "The Road to Nowhere". My husband and I traveled from Michigan to this beautiful cabin for our honeymoon. Despite being foggy and rainy the weather was much warmer than our 10 degrees in Michigan. We are very pleased with the views and how beautiful the cabin is. We will definitely be back. Thanks so much for the beautiful stay. We had everything that we needed. Loved the hot tub. We traveled all the way from Michigan to this beautiful cabin for our honeymoon. Despite being foggy and rainy, the weather was much warmer here rather than our 10 degree weather back home. We are very pleased with the views and how beautiful the cabin is. We will definitely be back. Thank you so much for the beautiful stay. Very scenic and very, very homey feeling!!! You guys have found customers for life. I can't say enough how pleased we are. My boyfriend, our grandmother and I had an amazing time here. It was so peaceful and relaxing. This cabin is absolutely beautiful and we can't wait to come back. It was worth every penny. The Hot Tub was great, had plenty of room for the 3 of us. Can't wait till next year. The whole process was easy; from booking to check-in and checking out. Very efficient. I loved this cabin. My son and I get away every winter in search of snow. The cabin was very nicely located for us. It was private, yet had neighbors in case of an emergency. It is located near Bryson City, which is a lovely little town, (just our speed.) We were able to hike, saw waterfalls and did get some snow this trip; all very close to where we stayed. Our last day we made a day trip to Cades Cove and Cherokee. As for the cabin itself, it was very clean and had everything we needed to make a temporary home. Lots of extra blankets and pillows also. We will certainly come here again. We came here only going to stay two nights. But once we saw the cabin we ended up staying 3 nights. It was a much needed weekend away with the family. We only left a few times for food and shopping. Thank you for a little time away. Shortly after arriving at the cabin we received a call to make sure we had everything we needed. If we had any problems they were a phone call away. We called one morning to see how the roads and mountain driving were going to be later due to a snow storm that was coming through. They said if we had to leave to be back by early afternoon and if we needed help that someone would guide us back up the mountain. They were very helpful and very friendly. Can't wait to go back. We absolutely loved the Sun Eagle Lodge cabin. It was everything that they advertised. The views were fantastic from every angle. Standing outside you could hear a pin drop. So quiet and peaceful. Bryson City was such a small and peaceful little town. Everyone was so nice. (Coming from South Florida its a nice break to have). We went skiing and snow tubing in Maggie Valley which was cold and lots of fun. (It was 4 degrees when we arrived at the ski mountain) We had plans to go to Gatlinburg, TN and take a few more scenic drives all in one day but due to the weather the day before it caused to close some roads. But that didn't stop us from enjoying vacation in a beautiful place. My best friend and I drove up from Charleston, SC to record an album. We brought all our equipment and stayed in the cabin most of the time. We honestly couldn't have picked a better location. The area and scenery were very peaceful. This more than likely will not be our last visit. The cabin and location are perfect for creativity. The property is in a great location and has great views. 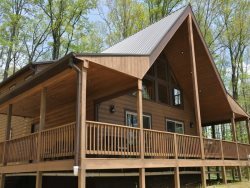 The upgraded finishes were nice, making it more of a vacation home and not just a cabin. Thank you so much for letting my family share in the memories here at Misty Mountain. The first night we stayed in it started to snow. It was the first time my husband and my three kids had ever seen snow. The 24th was my birthday we celebrated by building snow men and having a snow ball fight. Seeing all of the smiles on the kids faces made this whole trip even better. Thank you for the many memories. We chose this cabin last year for our honeymoon. Had to come back for our one year anniversary This is a beautiful place. Cherokee is very close as well. It is so peaceful here. Truly one of Gods Gifts. We plan to bring our kids this summer and keep making wonderful memories here. You guys are fantastic! You guys respond quickly to every e-mail. I can't appreciate that enough. This cabin was absolutely fantastic, with great views! We've booked through you guys in the past. Previous excellent service, had us booking through you all again. We had a great time. I wish I could have seen a bear. We loved the snow and had a great time plying in it. Fond Memories, warm hot tub, and fresh mountain air. Our experience this weekend was memorable and was made even better by staying in such a beautiful cabin. A pleasurable stay, peaceful, beautiful and scenic.